Proposable takes the pain out of creating, and delivering winning sales proposals and gives you new insight into how interested your prospects really are. Connect your NetSuite CRM account to Proposable to sync your contacts and deliver professional interactive sales proposals to all your clients and prospects. 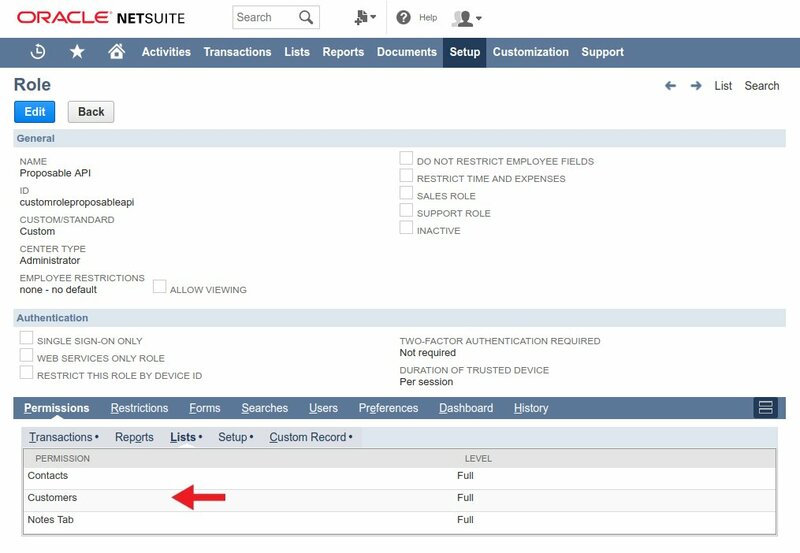 Depending on your workflow, you can set the integration to automatically create new opportunities for proposals sent to NetSuite contacts, or you can choose to connect and push back into existing opportunities. 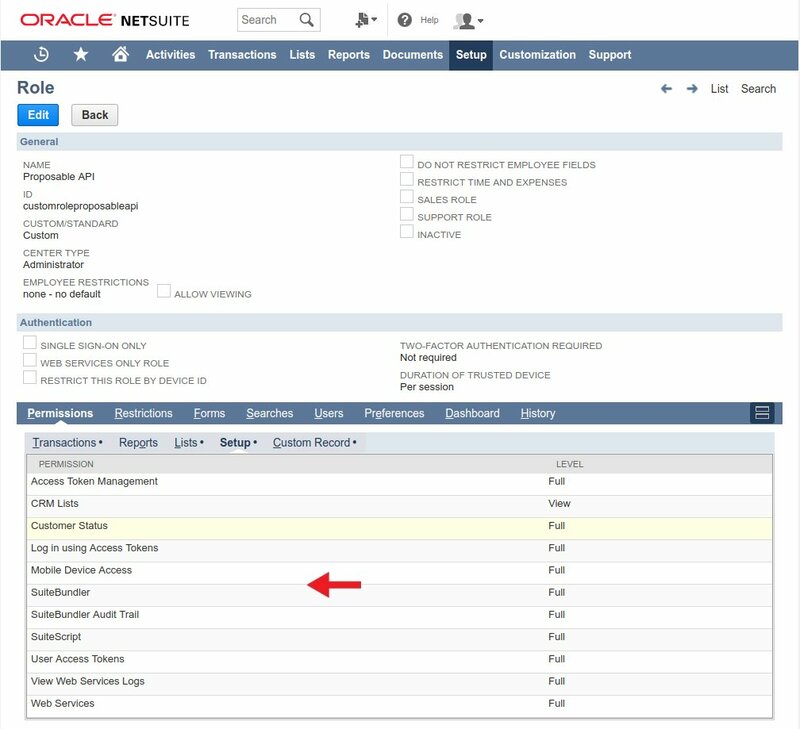 Proposable will add the proposal link, proposal comments, PDF download and digital acceptance receipt back into the NetSuite opportunity record as these events happen. To create your consumer key and secret go to Setup -> Integration -> Integration Management -> Manage Integrations -> New, or simply search "page: integrations" and select new. 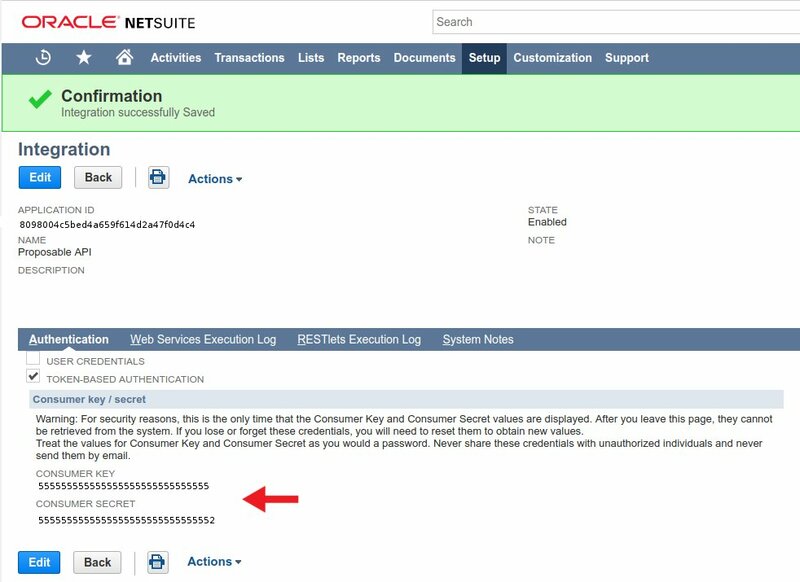 Enter a name for your new Integration and under Authentication deselect "User Credentials" and select "Token-Based Authentication"
After saving your integration, Netsuite will provide the Consumer Key and Consumer Secret. Note: this will be the only time it is displayed. 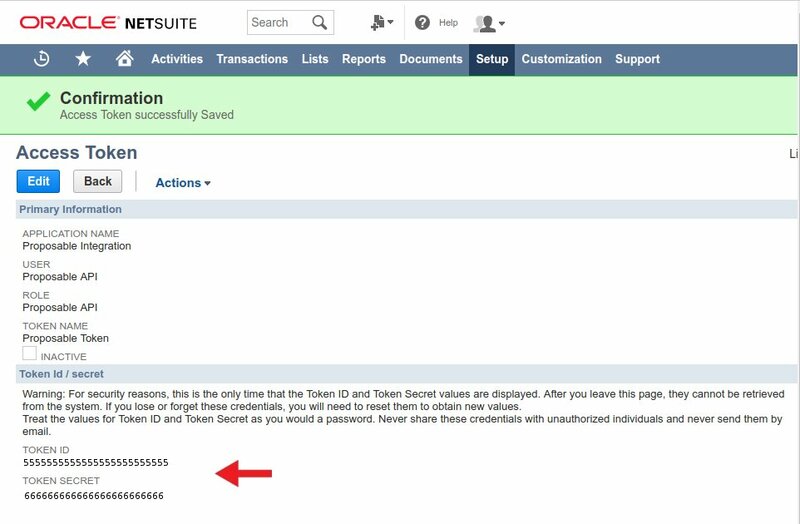 Next, before creating your Token ID and Token Secret, first create a role with the correct permissions to access Token Authentication and assign it to a user. We recommend creating a new user for this purpose, otherwise you may encounter unexpected permission conflicts that are difficult to troubleshoot. To create this role, search "page: manage roles" and click New Role. Enter the name of your new role (no other changes are required in the General and Authentication sections). At the bottom of the dialog, you'll set the following "Permissions". Add the "Opportunity" permission (level full). Add the "Contacts" permission (level full). Add the "Customers" permission (level full). Add the "Notes Tab" permission (level full). Add the "Access Token Management" permission (level full). add the "Log in using Access Tokens" permission (level full). add the "Mobile Device Access" permission (level full). 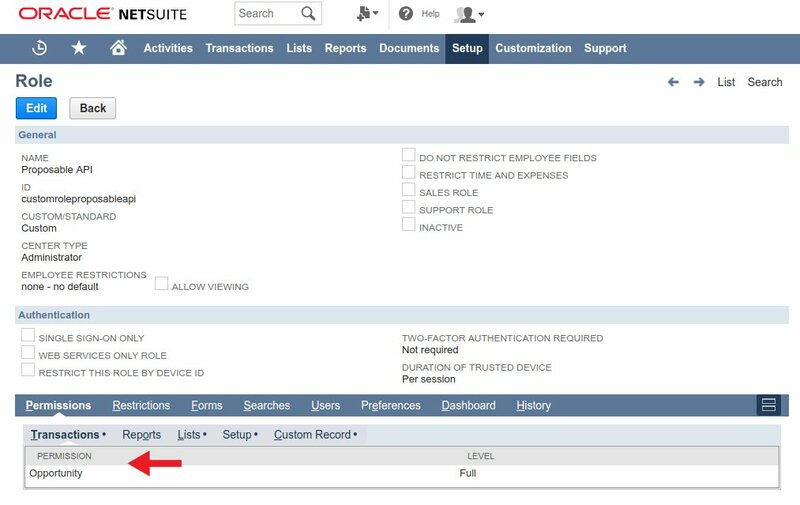 add the "SuiteScript" permission (level full). add the "User Access Tokens" persmission (level full). 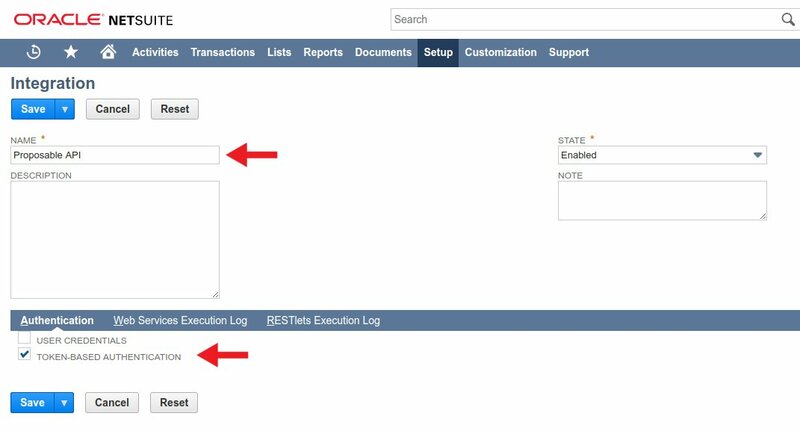 add the "View Web Services Logs" permission (level full). With the role created, we need to assign it to a user. Again, we recommend creating a new user for this purpose. Once you have your user, navigate to the bottom of the user dialog and click the "Access" tab. Here, we will assign the role we just created to the user, under "Roles". Note: No global permissions are required, and if set, they may cause permission conflicts. Excellent, we can now create our Token ID and Secret for the Integration (Consumer Key and Secret), Role, and User created and configured above. 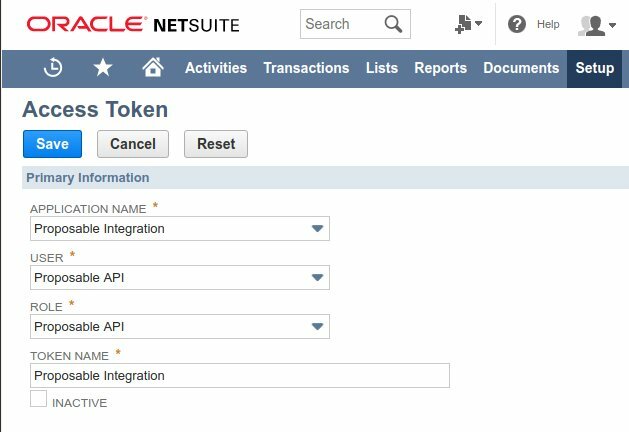 To do this search "page: tokens" and select the name of the Integration we created above, select the user you've created for this integration, select the role we just configured, and provide a name for the token. After saving, you will be provided with your Token ID and Secret. Note: this is the only time these values will be displayed. At this stage, you now have your Account ID, Consumer Key, Consumer Secret, Token ID, and Token Secret. You can use this to configure your Proposable integration in your account at Proposable -> Settings -> Addons. 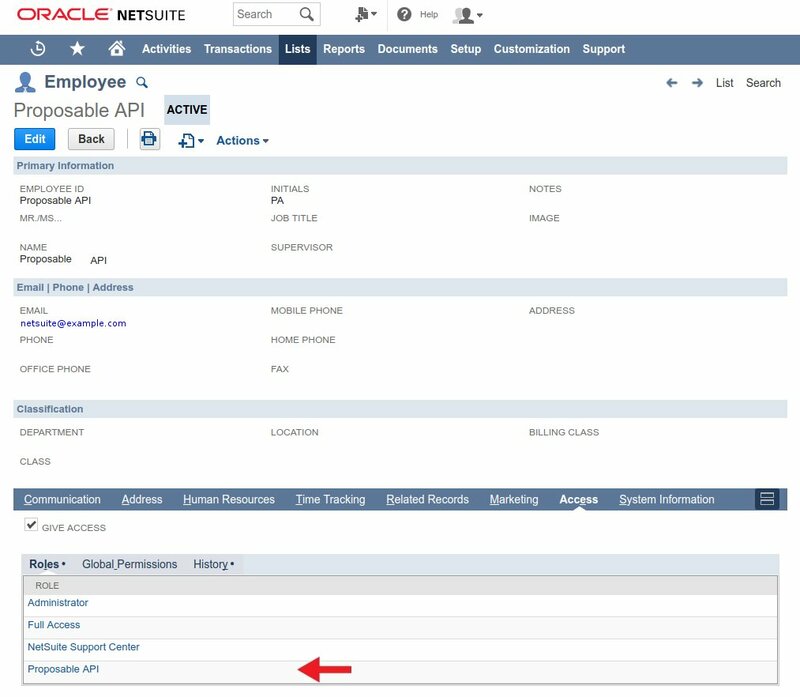 There you will find the NetSuite integration option.